Yemen: Will Saleh Sign the GCC Deal that the Youth Oppose? Yemenis have patiently waited ten months too many for President Ali Abdullah Saleh to step down. What started as a demand for a regime change, turned into an outcry for the regime's fall following the first drop of blood. Yemenis have suffered greatly from Saleh's stalling in signing the GCC deal and have been paying the price with their lives. They have endured hardships, suffered from shortages in basic needs such as cooking gas, electricity, fuel and water, and have been subjected to the growing violence of the regime and the deteriorating economic and refugee crisis in the country as a result. The world had been idly watching and waiting for Saleh to sign the deal while the Yemeni people have been dying and suffering for months. Yemeni activists started an online campaign to express to the world that like the millions who have been marching on the streets of Yemen for months, they too reject the GCC deal. The campaign is run under the hashtag #No2GCCdeal, where they express reasons for their rejection of the deal. They also started a “No to GCC deal” page on Facebook. Yesterday, Monday Nov. 21, President Ali Abdullah Saleh has agreed to sign a plan to transfer power to his deputy. 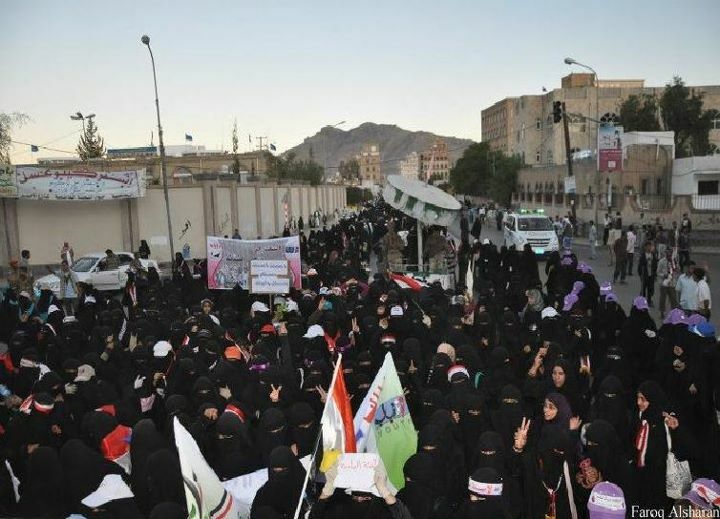 A mass women's rally in Taiz condemning crimes committed by forces loyal to President Ali Abdullah Saleh against civilians. The southern city of Taiz witnessed Tuesday a mass rally condemning crimes committed by forces loyal to President Ali Abdullah Saleh against civilians. Many Yemenis strongly believe that President Saleh deserves no immunity after all the bloodshed he had caused over the past months. President Saleh had already backed off from signing the GCC deal three times before, so the big question remains, will he sign the GCC deal or not this time?